I am a very judgmental shopper – I inspect the seams and make judgments on the quality of the workmanship. I have left a lot of garments on the rack due to fabric that looks or feels “cheap.” I suspect that I share these shopping habits with everyone that knows how to sew, but doesn’t have time to make it through the pile of fabric that they just had to have. I also read labels, before I make a purchase and again before that first trip to my washing machine or the dry cleaner. While I am a careful consumer, and someone who has relied on wool to make it through more than 30 Michigan winters, I must confess that the Federal Trade Commission cares a lot more about the details of wool labeling than I do. (A) the percentage of the total fiber weight of the wool product, exclusive of ornamentation not exceeding 5 per centum of said total fiber weight, of (1) wool; (2) recycled wool; (3) each fiber other than wool if said percentage by weight of such fiber is 5 per centum or more; and (4) the aggregate of all other fibers: Provided, That deviation of the fiber contents of the wool product from percentages stated on the stamp, tag, label, or other means of identification, shall not be misbranding under this section if the person charged with misbranding proves such deviation resulted from unavoidable variations in manufacture and despite the exercise of due care to make accurate the statements on such stamp, tag, label, or other means of identification. (B) the maximum percentage of the total weight of the wool product, of any nonfibrous loading, filling, or adulterating matter. (C) the name of the manufacturer of the wool product and/or the name of one or more persons subject to section 68a of this title with respect to such wool product. (D) the name of the country where processed or manufactured. 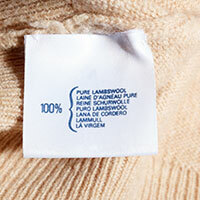 (3) In the case of a wool product containing a fiber other than wool, if the percentages by weight of the wool contents thereof are not shown in words and figures plainly legible. (4) In the case of a wool product represented as wool, if the percentages by weight of the wool content thereof are not shown in words and figures plainly legible, or if the total fiber weight of such wool product if not 100 per centum wool exclusive of ornamentation not exceeding 5 per centum of such total fiber weight. … and this Section of the Act, 68(b), goes on and on, to distinguish 18 levels of ‘Super’ micron by micron. Yes, I put you through the actual language of the “misbranding” provision, instead of treating you to an easy to read summary, to make a point. Particularly in regard to misbranding, the Act’s requirements are daunting. Additionally, effective August 1, 2016, the maximum penalty that the FTC could issue for “misbranding” increased from $16,000 per violation to $40,000 per violation. If this and other recent penalty increases are a sign that the FTC intends to more aggressively enforce the Act’s very detailed wool garment requirements, I strongly encourage anyone that is fairly new to the garment industry to think long and hard before opting to use wool. When you are ready to wrap your consumer in wool, you will need to read and understand a lot more than this blog post or budget for someone (like me) to ensure that you will meet all labeling requirements, provide advice regarding how you can avoid liability by obtaining a proper guarantee, and make sure that you understand and follow the Act’s record keeping requirements.